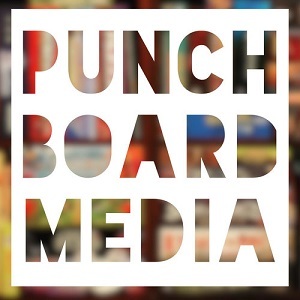 'In Focus: Women of Board Gaming' is an exclusive series from Punchboard Media that spotlights women in all facets of the board gaming industry. Our guest this week is Dani Ammer, designer of Cuisine a la Card. The interview was conducted over email by Eric Buscemi. So nice to be able to talk with you! Before we talk about your art and design, let's find out a bit more about the games you like to play. What are some of your favorite game mechanisms? How about designers? What have you been playing recently? I find myself drawn to games with a sense of progression and escalation of systems -- so games with mechanics such as deck-building, worker placement, or engine-building really interest me. I always love the compounding nature of the gameplay in these types of systems, and relish in the moment when everything comes together and I can just steamroll a turn - that really feels great! I also love games rich in theme, especially when the theme and the mechanics become an interconnected loop that feed into one another. Designers like Bruno Cathala, Uwe Rosenberg, Richard Garfield all do this really well. As for games I’ve been playing recently, I’ve been really loving the Arkham Horror card game (it’s my current go-to solo game), Tiny Epic Galaxies, and Terraforming Mars. 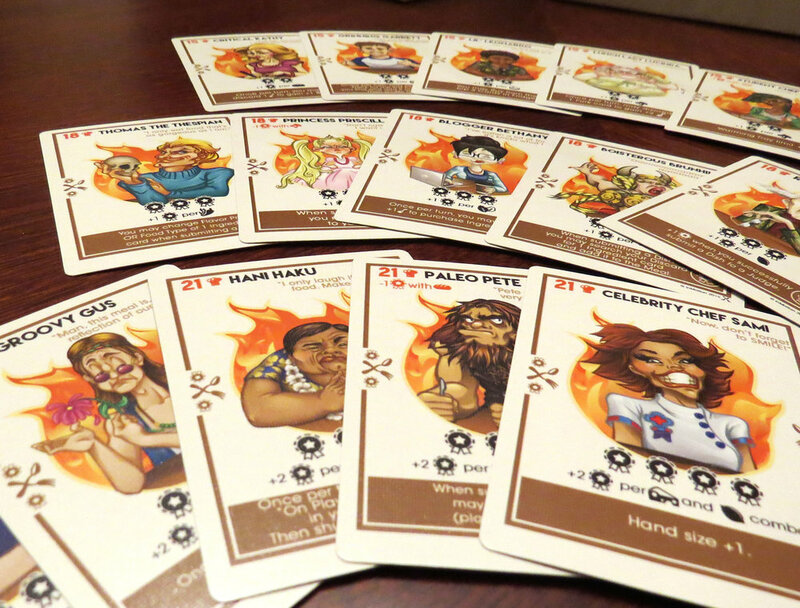 Your first tabletop game design was Cuisine a la Card, which was published via Kickstarter back in 2015. What gave you the idea for the game? Did you start with the theme first, or begin with the idea of working on making a deck builder? It started with the theme. I was watching a lot of cooking competition shows, like “Chopped”, and I kept thinking about how similar that show in particular was to a lot of deck-building games. Everyone starts with the same initial ingredients, (almost like a starting hand of cards), and it sort of developed from there. You were also the artist for Cuisine a la Card. Was it nice to have the control of doing both the art and design? Or was it too stressful handing both? It was a bit of a double-edge sword. It was great having that much control, but also nerve-wracking because it was all on me. If it failed, it was my responsibility - I couldn’t say “oh, it must have been x” because I was responsible for all of it. I also had to manage my time really well. I tried not to work on any of the art until the designs reached a certain point. Then, as I worked on refinement and playtesting, I developed the artwork. And of course, once the artwork was done, I had to move over to community manager/pr/customer service/sales rep - everything that comes with maintaining and promoting a Kickstarter. It was crazy! Cuisine a la Card was published on Kickstarter by InMotion, a video game company that makes mobile titles. What made them want to publish this tabletop game? They really took a chance on it. At the time, they had just shipped a mobile game project, and had some bandwidth to spare -- meanwhile I had been putting together board game nights at the company for years. So when I pitched the idea to them, I was delighted that they were gracious enough to give me the time needed to get it off the ground. You also worked with InMotion to make mobile video games before making Cuisine a la Card. How is that different than making a physical card game? What similarities do the two types of design share? Coming from a video game background, I was very used to defining certain parameters at the outset of a project -- what system(s) are we releasing on, what’s the min spec on these devices, what audience(s) are we targeting on said devices, etc. -- then using these parameters to guide decision-making throughout the project. Within a tabletop space, however, I found I had far fewer of these initial definitions to make. There are obviously still constraints -- target audience and accessibility considerations, how to visually communicate mechanics on physical components, etc. But I felt like I was a lot more free to explore my early designs in this space. What’s most interesting to me, though, is that in spite of what you might expect, this increased “freedom” (when utilized properly) can actually lead to simpler games with better-defined mechanics and interactions. It’s almost like a distillation process -- coalescing disparate bits of fun down into a smaller, denser, purer form. I actually think all video game designers should try their hands at designing a tabletop game - even as just an exercise. It can be a very enlightening process. You are currently working on some new tabletop designs. Anything you can share with us about them? They’re still in early stages currently. And - surprise surprise - they both started with the theme! One of them is a worker placement game about managing an animal adoption shelter - all about keeping the animals happy and finding forever homes for them. But the other one is more of a RPG campaign experience. That’s all I want to say about that one for now but I’m really excited about it. You're also launching a monster bestiary on Kickstarter in the near future. Tell us about your role in this project. Did you do the writing and illustrating for it? So this is something I’m extremely excited about! I’m creating the artwork for the book and co-writing it with my husband. It will be a full-color story-driven journal about a pair of naturalists who travel fantasy landscapes to uncover the rare and unknown creatures that you never hear about. I’ve loved drawing creatures my entire life, and have always wanted to do something like this, so I’m thrilled to finally be making it! Any tips or tricks you learned from the Cuisine a la Card Kickstarter campaign that you plan on using in your upcoming Kickstarter? Be authentic. That’s the most important thing I realized when I was running the Kickstarter and going to conventions and meeting people for Cuisine. The tabletop community really is one of the best, most knowledgeable, supportive, and generous group of people I have ever met. They are genuinely interested in new ideas, experiences, and most of all -- people. So don’t try to go out there and be something you’re not -- just be authentic, and people will appreciate it and support you because of it. Before we wrap up, is there anything else you'd like to share with us? Any other hobbies, interests, or passions? Ha! Of course -- my husband actually likes to tell me I have too many hobbies! And of course, they all revolve around making things. I enjoy quilting, baking, and I love taking care of my backyard garden. But probably of most relevance here is that I’m also very much into miniature painting. I’ve got a dedicated art station in my craft room where I like to just zone out and paint. And I do sometimes post the results to my Twitter (@Singing4est), if you’re interested. Any good tips or resources for board gamers looking to get into mini painting? Sure! I highly recommend getting a starter paint kit, something simple just to get started, and a mini you’re comfortable experimenting on. There are also some really great instructional videos on YouTube. Sorastro is one of my favorites because he does a great job breaking down each step and teaching the hows and whys of each of his steps. The key is just to have patience and perseverance. The first mini might not look great, but that’s okay! It’s all part of the process.